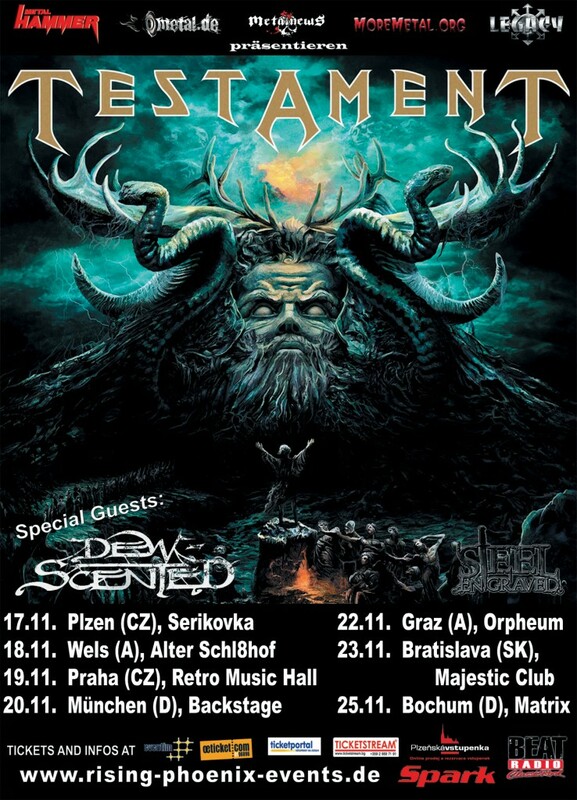 DEW-SCENTED - Relentless Thrash Metal from Germany - DEW-SCENTED » Dew-Scented confirmed to support Testament in November! DEW-SCENTED - Relentless Thrash Metal from Germany - DEW-SCENTED » Dew-Scented confirmed to support Testament in November! Home > NEWS	> Dew-Scented confirmed to support Testament in November! After the dates with Six Feet Under, the summer festivals and the recent hometown show and awesome party in Walsrode, we now look forward to making this another great run of show in support of the “Icarus” album, especially since Testament has always been an influential band and personal favourite for the Dew-Scented members! More Tour Dates Confirmed! Checking in after tour; Hometown show; New merchandise!